Horvath was down and counted over twice but was down several times more in a blatant quit job. The much smaller Farkas fell over easily and was counted out. GBFed title - and how did Murko last that long?? Thorslund won the vacant WBC female interim superbantam title on scores of 96-94 twice and 97-93. Ashley blew the fight with a rather passive first four rounds where she showed slick moves but little action. After the fifth Ashley began to take the fight to Thorslund and turned the fight around but it was too little too late. On my card she salvaged a draw but not more. Hannig proved to be a heavyhanded puncher and he took it to Bashanov´, who held up well despite beating and badly busted nose. Hannig, a bit heavy, looked as if he was about to punch himself out and Bashanov had a good third round but it all went downhill from there. Bashanov avoided many punches but didn´t fire back and in the fifth he finally went down. In the sixth he had nothing left and went down and out after a triple left hook downstairs. Best fight of the evening though. Sanchez didn´t retreat - he was in it to survive while Ceylan stalked him. Sanchez threw long, wide punches and late in the second one caught Ceylan who went down on his back, got up but was wobbly and it was stopped in a major upset. Later, Sanchez would say he knew Ceylan started fast as they had sparred in Madrid and thus tried to stay out of harm´s way. Ljungquist found a home for his southpaw left and floored Kohout twice in the second. Marutjan covered up well and won clearly, 40-36 twice and 39-37, but need to show more. Gvajava can both fight and punch a little but more positive work is needed from a so called prospect. 60-54, 59-55 and 58-56 for "Pjatrov" - but not a good fight or performance from Nielsen. 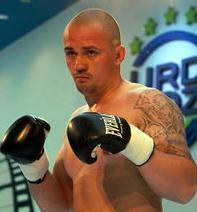 Shalamberidze, a southpaw, showed the better skills but lacked the strength or conditioning of his opponent. 39-38, 39-37 Pelaez and 39-37 Hede, a southpaw who worked very hard but was seldom effective and tired while Pelaez green as he is showed the better skills. 40-36 twice and 40-35. To say that Lakatos was in it to survive is to put it mildly. He didn´t throw a punch for two rounds, just avoided punches, moved and clinched. Thanderz won the vacant WBC Int´l female lightweight title on scores of 78-74 twice and 79-73. Gudsteinsdottir came in on short notice after Taoussy L´Hadji pulled out after problems with the strict Norwegian rules and the fight went from an EBU fight at superfeather to WBC Int´l at lightweight. BBU title - off as Hagen was forced to pull out due to a broken nose. IBO eliminator - announced as "2-1". Johnson forced out with a cut eye after a headclash - and that killed a fight for the WBConfederation title in Potsdam in two weeks. It was called off by the doctor and while it was bad gash blood didn´t seem to get in Johnson´s eye. WBFed Int´l / Eurasia titles (vacant), 97-94 Trenel, 95-95 twice. Italian title, scored 98-90, 97-91 and 99-92.